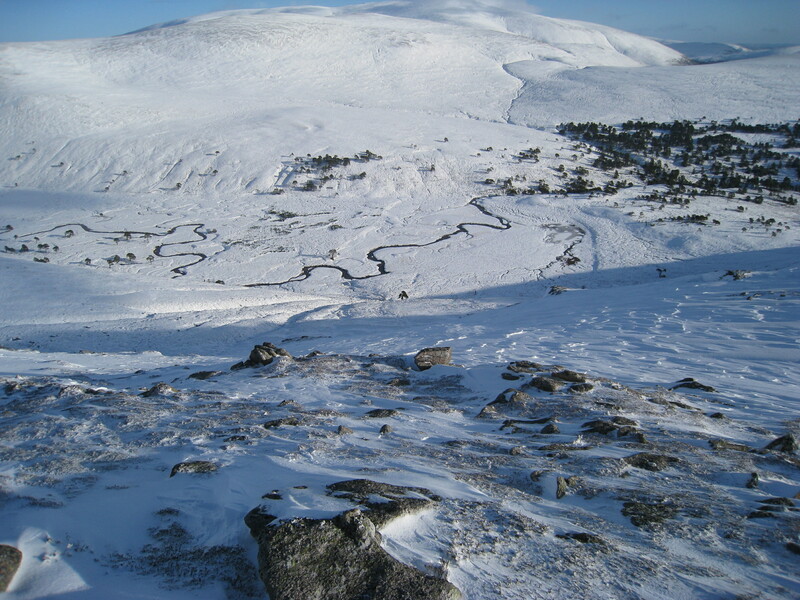 Looking down on Glen Derry in winter. The glacial dam can be seen towards the right, just before the trees. Take a walk up Glen Derry in the Cairngorms sometime. Pass Derry Lodge and veer right at the wee wooden bridge. Follow the footpath through some of the most beautiful pine woods in Scotland, along beside the Derry Burn and up a rise to wend through a grove of apparently miniature Caledonian Pine, none more than about 20 feet or so. The view through these trees, up to the rock-grooved southern face of Beinn Mheadoin, is wonderful, and almost unchanged – trees and all – from a photograph taken in the 1920s or 30s; these trees may not be large, but they are old nevertheless. As the trees end the path starts to slope back towards the Derry Burn, and a metal bridge which you cross on your way to the head of the glen and a choice between the Lairig an Laoigh or Coire Etchachan. 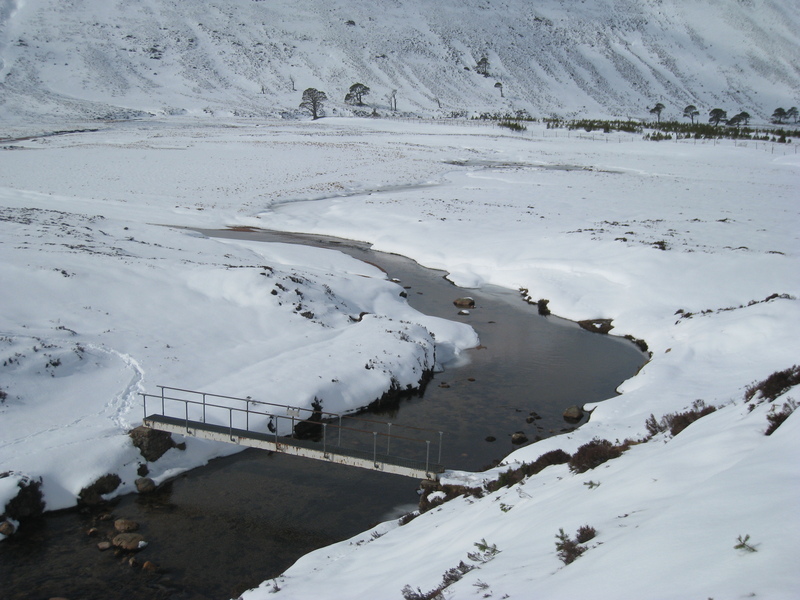 But stop as you cross the bridge and look upstream – it’s a bonnie enough view again and you’ll probably be doing it anyway, looking into the clear pool to see if thgere are any fish darting about, or looking up to see a great view of Coire an Lochain Uaine on Derry Cairngorm. The metal bridge at the Derry Dam. The mound above the middle of the bridge is one of the ends of Davidson's dam. But pay attention to the shape of the ground just upstream and you’ll be looking at all that remains of Alexander Davidson’s dreams. On either side of the burn, just yards upstream from the bridge, are mounds on either bank that mark the ends of a dam. 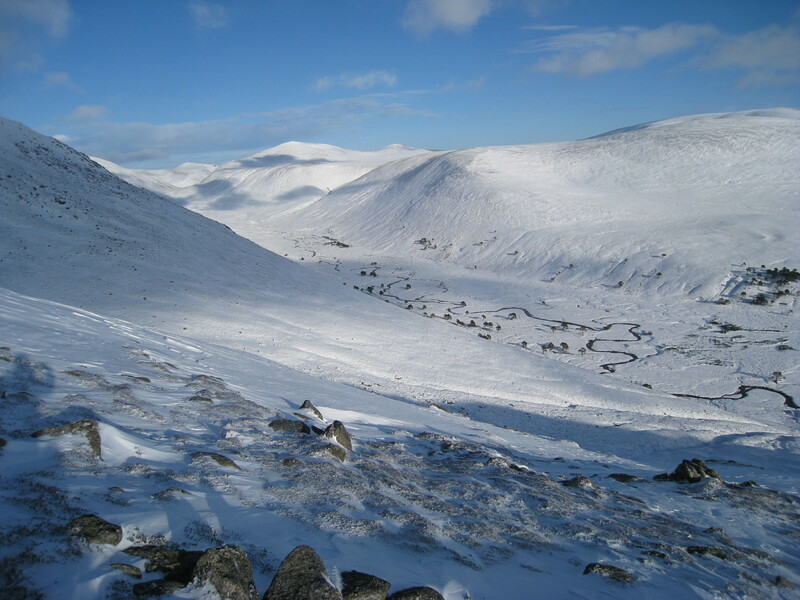 Glen Derry in winter, from the slopes of Carn Crom. The flat floor of the glen, with the prominent river meanders, might once have been a huge loch. The whole thing is a dam, of course. It’s known as the Derry Dam and stretches right across the glen, a massive earthwork bulldozed up by some long gone glacier. Look from above and you can see it easily, squint your eyes and you can picture a loch stretching far up the glen. Over millenia, or maybe as quick as a few hundred years, the overspill from this loch must have eaten through the earthwork – that’s it you’re walking on when you’re going through the grove of ‘miniature’ trees – to form the present course of the Derry Burn, cutting through a steep-sided defile that makes a bonnie wee wander if you have the energy to forsake the path. But the two mounds you see either side of the burn are much more recent. In the early 1800s former whisky smuggler Alexander Davidson bought a quantity of wood from the Earl of Fife. To get the felled trees to market in Aberdeen, 70 miles away, he had to float them down the river, and that required more water than normally flowed down the Derry Burn. As was done on the Spey side of the Cairnmgorms, he had a dam constructed to allow a reservoir of water to build up, and the ‘Derry Dam’ was ideal. Once the dam and sluice gates were built just above the present metal bridge, a large area of water was held back to be released at just the right time to flush the logs down the Derry, into the Lui and on into the Dee and, eventually, Aberdeen. The dam worked, and exciting and often dangerous times were had getting the logs down a river not always suited to their smooth passage, but in the long term the venture was the ruin of Davidson. Getting the logs to Aberdeen proved more expensive than he had reckoned, and the final straw was a bit of shady dealing by the Earl of Fife which left Davidson out of pocket by 200 pounds – a considerable sum in those days. Having given honest business a try and getting his fingers burnt, Davidson turned his hand to poaching, a vocation at which he is said to have excelled and which defined his life until the end of his days, which came at the age of just 51 in 1843. His dam was apparently destroyed in the great flood of 1829 which also created the Sands of Lui up at Preas nam Meirleach and forced the inhabitants of the now ruined Delvorar Farm in Glen Dee to flee for their lives. Alexander Davidson’s colourful story is told in Michie’s ‘Deeside Tales’ (1872) and also in ‘The Romance of Poaching in the Highlands’, by W. McCombie Smith (1904), a rare wee book that can occasionally be found in a 1984 reprint and is well worth seeking out. This entry was posted in History and tagged Alexander Davidson, Cairngorms, Derry, Derry Burn, Derry Dam, Glen Derry, lumbermen, trees. Bookmark the permalink.